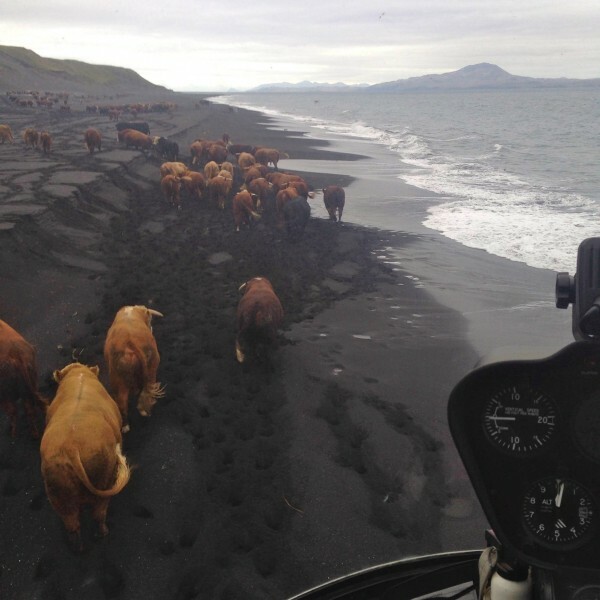 For the first time in five years, helicopters and cowboys are rounding up cattle by the hundreds on Umnak and Unalaska islands. The Bering Pacific Ranches at Fort Glenn on Umnak Island are herding their tundra-roaming cattle to take them to market. Herding by helicopter. Curtis Norman photo. Alaska agriculture officials say the Bering Pacific is the state’s biggest cattle operation. It’s also the only one with cowboys herding by helicopter. “Helicopters started working from Nikolski toward Ft. Glenn, pushing the cattle every moment they can that the weather would allow,” Julianne Tucker with Bering Pacific Ranches said. Tucker said, this time of year, the weather’s “pretty sketchy” for herding by helicopter. But herding has to wait until calves are old enough to endure being separated from their mothers. Tucker said the helicopters and the ranches’ five cowboys have rounded up about 550 cattle so far, with another 1,400 or more to go. She estimated the total cattle population at about 6,000. After the roundup, the bulls will get put on a landing craft and taken across Umnak Pass to Chernofski Harbor on Unalaska Island. 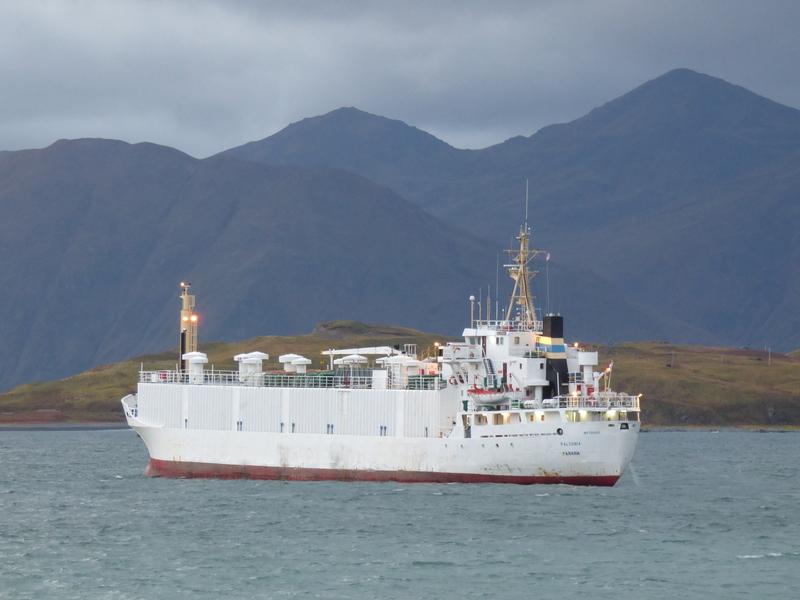 There, they’ll be transferred to the livestock carrier Falconia–a big white ship that’s been anchored across from the Unalaska Safeway this week. The Falconia is managed by a Danish company and flagged in Panama. Oregon Tilth certified Bering Pacific Ranches as organic on Sept. 22. Tucker said it’s been hard to find an organic slaughterhouse for their organic, free-range beef. The livestock carrier Falconia in Unalaska Bay. KUCB/John Ryan photo. The bulls will be taken to a certified-organic slaughterhouse in British Columbia. Tucker said she doesn’t know yet where beef will be sold from there. “We need to produce more of our own food and not rely so heavily on food that’s flown up here or shipped up here,” he said. Tucker said once the cattle go to the Canadian slaughterhouse, they become Canada’s product. She said they only learned this week that they can’t ship straight from Alaska to the Lower 48 with a foreign-flagged ship like the Falconia without violating the Jones Act. But she said Bering Pacific is looking for ways to sell its product in Alaska in the future. She also said the Discovery Channel is interested in doing a show on the ranch. Alaska’s only certified organic cattle operation in the USDA database for 2014 was the Sitkinak ranch near Kodiak. That ranch sells ground beef online for about $3 a pound.